The Final Season of Game of Thrones premieres on Sunday, April 14, 2019. So I thought it was time to go over the numerous ways HBO is available to you without a cable TV subscription. Just a few years ago cord cutters were devoid of ways to watch HBO. Now there are nearly as many places to watch HBO Online as there are dead Starks. HBO’s streaming service is top notch. Aside from Game of Thrones, HBO’s biggest hit ever, you receive all the original content offered by HBO. Hit shows like True Detective, Silicon Valley, Veep, Westworld and more are all at your fingertips. Furthermore, it’s not just the current seasons that are available, but the entire HBO originals archive. Missed out on The Wire? You can binge watch it. Didn’t catch the last episode of Sopranos? Okay, I was really tempted to just end the post there. If you don’t know why that’s funny, then you really need to watch the last episode of Sopranos. Think of all the Original Series HBO has produced over the years. These HBO streaming services provide access to nearly all of it on demand. Furthermore, you have on-demand access to a movie catalog that rivals Netflix and Amazon Prime. If you subscribe to Hulu, they also offer HBO for $14.99 per month. You can sign up for a 1-month free trial and test out their service and add HBO. Hulu lets you watch HBO on a number of Smart tvs and streaming devices like Roku, Amazon Fire TV, Apple TV, and Google Chromecast. You can also watch iOS, Android, and Windows Smartphones and Tablets, Xbox One, PlayStation 4, and much more. As I wrote in my Hulu TV review, Hulu now offers live channels as well. Furthermore, HBO is available to all customers whether they are subscribed to the Live TV service or just Hulu’s on-demand library. PlayStation Vue is a great way to watch HBO online and also get a ton of TV channels without needing a cable provider. Vue’s entry package costs $44.99 per month and delivers over 50 channels over the internet. Adding HBO will cost an additional $15 per month. These are channels you would typically see as part of a cable package like Freeform, Discovery, and of course HBO. 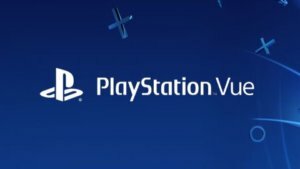 While you may assume that Vue is only available on PlayStation, that isn’t the case. Vue is also available on Amazon Fire TV and other streaming devices. See our review of PlayStation Vue for more details on what channels are available and device support. If you subscribe to Amazon Prime then you have access to Amazon Channels. Amazon Channels allows you to add certain channels to your Prime subscription so you can watch them through your Amazon Prime Video App. HBO is available through Amazon Prime for $14.99 per month and you can even watch HBO for free through this 7-day free trial. 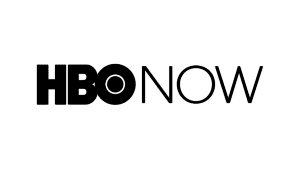 HBO Now has been available since April of 2015. It’s essentially HBO’s streaming service HBO Go without a cable TV subscription. It provides access to everything HBO has to offer on demand, and current seasons of shows are available the minute they air. That means you can watch Game of Thrones when everyone else in the world does and not have to wait until the next day. HBO Now is available on Apple TV, Roku, Chromecast, iOS devices, Amazon Fire TV, Chromecast, and Android devices. Below are instructions for signing up for the series on each device. HBO Now provides a 1 Month free trial regardless of the device you own. After the first month, the price is $14.99 per month and you can cancel any time since you are not locked into a contract. HBO Now is already loaded on Apple TV. Simply fire up the app and follow the onscreen instructions. If you are using your iPhone or iPad, simply download HBO Now from the iTunes store. Signing up was a breeze. Simply click the “download on the app store” button above to install HBO Now to your iPhone and iPad. You may have to log in to your iTunes account to continue. 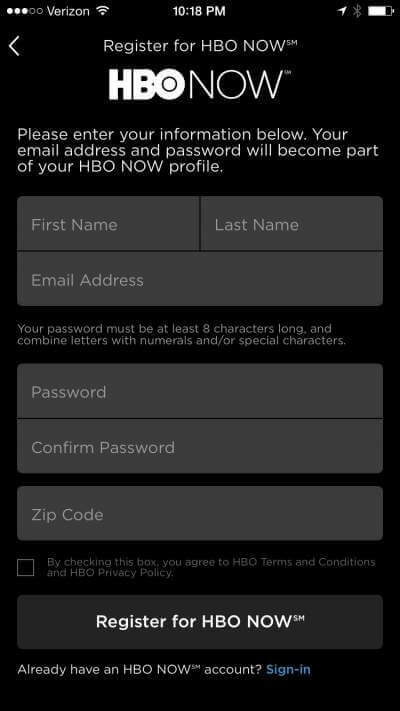 Once the app is downloaded, fill out the form pictured below and you are ready to enjoy everything available to traditional HBO subscribers. HBO Now app requires iOS 7 or later and is compatible with iPad, iPhone and iPod touch. 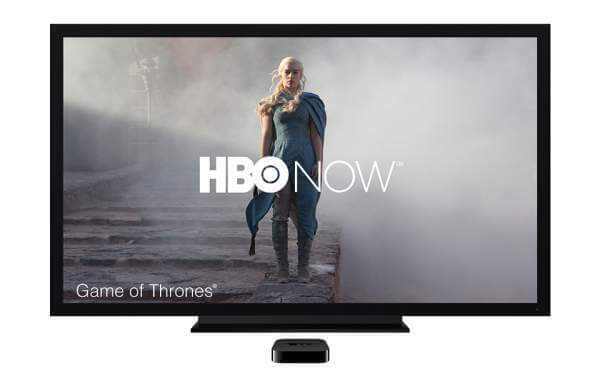 HBO Now can be viewed on your television through either the Apple TV HBO Now app or by simply using airplay to cast HBO Now to your Apple TV from an iOS device. HBO Now has updated their app to support Chromecast on Android and iOS devices. To sign up, simply download HBO now from Google Play store to your Android device (or iTunes using the link above for your iPad or iPhone). You can then cast HBO from your phone to your TV via Chromecast. Download the HBO NOW app from the Amazon Appstore for Android. Then start the app and follow the onscreen instructions. Once you’ve downloaded the app to one Amazon device, you can download HBO NOW to the rest of your Amazon devices by navigating to Settings and selecting Sync Content on the devices you want to use. Navigate to the Channel Store on your Roku player. You can search the channel store for HBO NOW. Once you locate the channel, select “Add Channel” and confirm the selection when prompted. If you have set up a PIN, you will be prompted to enter the PIN number. Press the Home button, HBO NOW should now be one your home screen. Start the app and follow the on-screen instructions. AT&T’s DirectTV Now service provides subscribers with popular pay-TV networks over the internet. This will allow you to watch the Game of Thrones Online, along with many other HBO shows. While DirecTV NOW’s entry-level package is a $50 per month, it includes HBO. The service is available on iOS, Roku, Android, Apple TV, Amazon Fire TV, Chromecast, most modern web browsers and more. 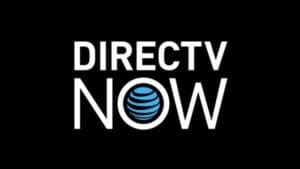 DIRECTV NOW currently offers a 7-day free trial.